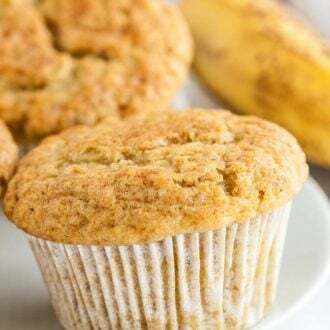 These easy Banana Muffins come together quickly and have a tender and moist crumb that makes these muffins a family favorite in our house! They bake up tall with bakery-style muffin tops and have the most delicious natural banana flavor. A quick and simple recipe to use up ripe bananas! In another bowl mash bananas then add melted butter and sugars. Whisk until combined. Let cool for 10 min in the pan then transfer to a cooling rack to cool completely.